From May 6 2017, Motorcycles, scooters and mopeds can use the Lewes Road bus lanes between the Vogue gyratory and the Stony Mere Way junction. This is for an initial 18 month trial period. What physical changes are taking place on the Lewes Road? Coloured surfacing at five key junctions was added at the end of 2016. The surfacing is designed to remind vehicles turning in and out of these junctions that they are crossing a moving lane of traffic, even if the general traffic lane is stationary. Bus lane signage is being changed to include a motorcycle symbol authorising access for motorcycles - see attachments below. Lining and surfacing repairs are being carried out in late spring/early summer 2017 and ongoing maintenance will continue throughout the trial. The aim is to improve journey times and reduce congestion on this key corridor. No vehicles defined as ‘tricycles’ (see DVLA V5C form) or any motorcycles with side cars are allowed. See our top ten tips for riding in the bus lanes in the motorcycle in bus lanes leaflet attached below. 12 months of monitoring will need to show no significant road casualty or speeding impact and an improvement in congestion. A decision will then be made on making this change permanent. The six month window for public comments on the Experimental Traffic Regulation order is now closed. Public comments will be reported to the Environment, Transport and Sustainability committee in due course. Motorcyclists can use two sections of bus lane on the A23 and A259 on a permanent basis. These are between Carden Avenue and Preston Drove on the A23 and from Telscombe Cliffs Way to the Ovingdean Roundabout on the A259. Tricycles and Motorbikes with side cars are not permitted. Edward Street has part time bus lanes, which recent UK research strongly suggests are less safe for Power Two Wheelers (PTW) users. Sight lines are difficult from some side junctions. The majority of other bus lanes fall below the Department for Transport recommended minimum width of 3 metres. Sussex Police have expressed concern about the safety of pedestrians and cyclists if motorcycles were to use these bus lanes. 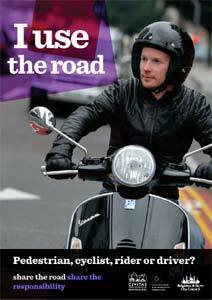 Moped and motorbike riders are one of the road user groups at highest risk on the roads of Sussex. Part of the reason is due to the difficulty of being seen by other road users and not being able to judge the biker’s speed easily. helmet - Sharp recommendation to change every 5 years unless involved in impact - in which case change immediately. Coming off at just 20mph and hitting the road surface unprotected can do some serious damage. Recent research backs up common sense - wearing boots means you are over 50% less likely to have foot/ankle injuries if you come off compared to shoes/trainers. Being visible in both what you wear and how you position yourself on the road will also let people see you. For more information go to the DirectGov riding motorcycles and mopeds page, or take a look at the share the road campaign and SSRP - safer for motorcyclists. The Enhanced Rider Scheme also offers advanced training to those who have passed their test. The South East Coast Ambulance Service Trust launched a new potentially life-saving scheme for motorcyclists called the ICE sticker. It will hold vital information about the rider to help ambulance staff treat riders involved in serious road traffic collisions. Should you be thrown off your bike and left unconscious or unable to communicate the sticker can be scanned and inform emergency services of who you are and key medical plus contact information. The ICE sticker from CERQL - is currently sponsored in Sussex by the Sussex Safer Roads Partnership. It enables you to upload onto a website a photo of you, medical and contact details which can be accessed on site via a QR code sticker on your helmet via a smartphone. If you have difficulty getting either of these products then you can contact transport.projects@brighton-hove.gov.uk. They are usually available at events where the Partnership attend. There are many similar robust commercial products which identify you and any medical conditions, which are worth carrying, just in case.